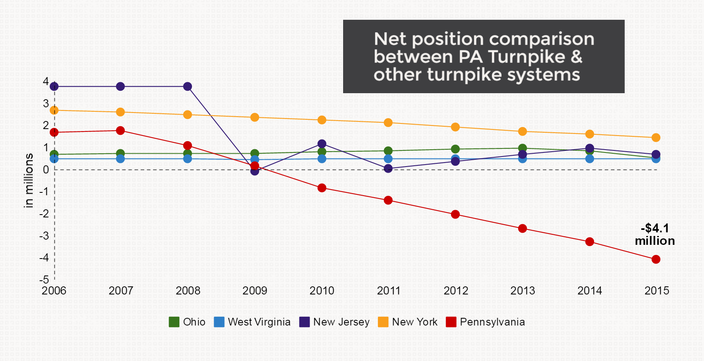 An audit claims that the Pennsylvania Turnpike Commission's financial situation could lead to dire consequences if new laws are not enacted. State Auditor General Eugene DePasquale announced on Tuesday during a news conference that the commission is on "potentially unstable financial ground" that could lead to "transportation disaster." The commission's financial situation has trended downward since 2007 and has not been addressed. Meanwhile, nearby state's turnpike systems have remained stable. The audit laid most of the blame on Act 44, which requires the commission to pay PennDOT $450 million per year through 2022. In order to make those payments, the commission is projecting a 215-percent increase in toll revenue through 2035 and a 44-percent increase in traffic volume through 2044. Coupled with annual toll hikes, DePasquale warns that the revenue plan is "nonsensical." The state legislature passed Act 89 in 2013, which will reduce those payments to $50 million beginning in 2023. However, PennDOT uses that money to support public transportation. The $400 million gap could potentially wreak havoc on state residents who rely on mass transit. The audit offered a call to action from state legislators. The commission currently lacks the power to collect unpaid tolls, which totaled $61.3 million in 2015-16 alone and $43.2 million remained uncollected at the end of 2015. DePasquale said that other states enacted legislation that forces unpaid fines and violations to be collected when delinquent drivers attempt to renew their registrations. “Though the turnpike commission has an extensive, multi-level process involving multiple collection agencies to try to collect unpaid tolls and fees, it lacks the authority to deter drivers from skipping out on tolls,” DePasquale said. “What the General Assembly needs to do is provide the authority to suspend a Pennsylvania vehicle’s registration until outstanding tolls and fees are paid." The audit warns that inaction could lead to a financial and statewide transportation crisis by 2023.